How is Pilates different from other fitness sessions? Pilates is an innovative method of mind-body exercise that combines strengthening, flexibility, and balance for a workout like you’ve never had before. Utilizing various apparatuses and props, each session is different and never like the one before. Our instructors go through extensive anatomy and biomechanic training to offer a well-rounded and tailored workout specifically for your body type. Many of our students suffer from previous injuries or surgeries and it’s our job to be able to build a modifiable workout for each individual. Pilates is a workout for someone who is searching for an exercise program that adapts to them, not something that they must adapt to. Anybody! It is one of the few, if not the only, fitness modalities adaptable to any body type. 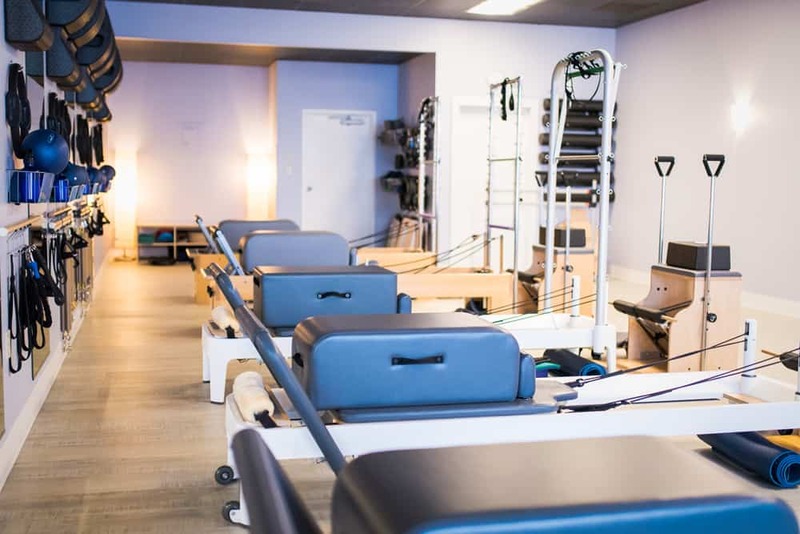 Given the comprehensive training of our instructors, and the versatility of the Pilates apparatuses, we are able to tailor, intensify, or omit exercises based on an to suit student experience, body type, or individualized goals. If I have a chronic injury or pain, can I do Pilates? Yes! 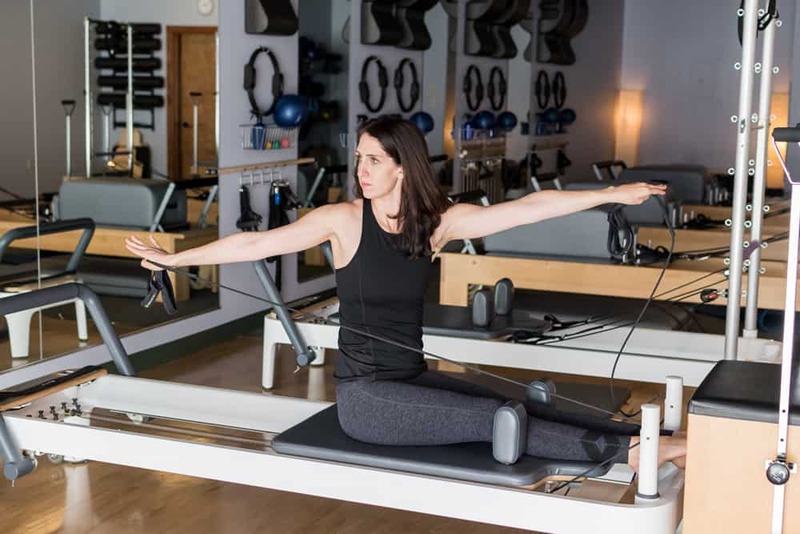 Pilates is often sought out for its gentle approach to fitness, therapy, and its unique flexible adaptability to any physical limitations or body type. 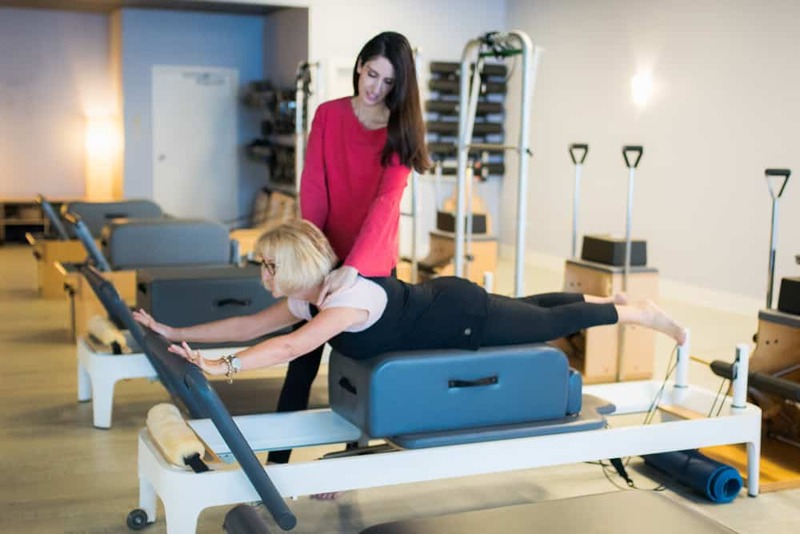 Many of our clients have purposefully sought us out based on these considerations, and have since experienced tremendous physical therapy results within the Pilates discipline, following knee or hip replacements, back surgery, etc. We always recommend that all students begin with at least one private, four being more preferable. This allows for the best preparation for entering classes, learning about proper form, equipment safety, your personal fitness goals, and limitations. How do I sign up for my first private session? Pure Movement offers an introductory first session for $35. Follow the steps below to fill out a waiver, purchase the private, and then request an appointment. If you have any issues with any of the steps or just want to chat, you may contact us via email at info@puremovementstudio.com or you can call or text us at 260-420-1000 to schedule your first appointment. We are open six (6) days per week, and will flexibly schedule you with an instructor based on your goals, needs, and availability. What should I expect with a first private session? An instructor will take you through the basic Pilates principles, including form, technique, breathing, and equipment usage. In addition, your personal fitness and movement goals will be addressed, including any limitations you may have from previous injuries or surgeries. This is exceptionally important as many students continue into group classes. Form fitting clothes are best (nothing very baggy, think yoga wear) as it allows the teachers to read movement lines better. In addition, sometimes baggy clothes can be easy to slip or trip on during a class. Are private or group lessons best? This all depends on personal preference and goals! The fastest way to achieve your own personal goals is through private sessions, however, many students enjoy the comradery of group classes and the more affordable price. Group classes are still very personal, with equipment classes no more than six people. How often do you want to see results? We recommend at least two times a week, three times being more preferable. Results, like many fitness programs, will only happen through consistency and dedication. The more you come, the better you will feel, and the quicker you will see results! Stick with it! Joseph Pilates famously said, “In 10 sessions, you’ll notice a difference, in 20 sessions, your friends will notice a difference, and in 30 you’ll have a whole new body.” Though there is no universal answer, the more consistent you are with the discipline, the faster you as a student will witness, experience, and feel long-term positive results. What is different from attending a Pilates studio rather than watching a DVD at home? Our job as instructors is to make sure that you have a safe, healthy, and well-rounded workout tailored to your particular goals and body type. We go through extensive training in biomechanics and anatomy to address your individualized needs no matter what history of injury or physical limitations you may have. Not to mention, in a studio setting, you’ll have the benefit of personal and professional instructors able to identify individual areas of student need and to offer real-time insight in developing proper movement in light of those. How Do I Get Started in Group Classes? 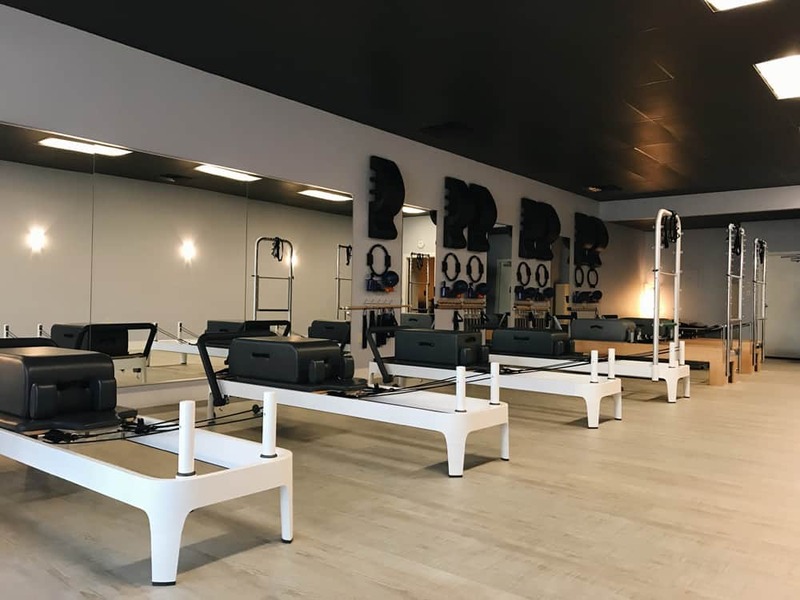 What are the intro offers for group reformer classes? Level 1 classes are FREE to try if you're new to Pilates. Fill out a waiver and book your class today! 10 Classes a Month: $99.00. You won't know the benefits of Pilates until you dive right in. Our popular 10 classes a month is offered at nearly half off your first month to get you used to the Pilates reformer. 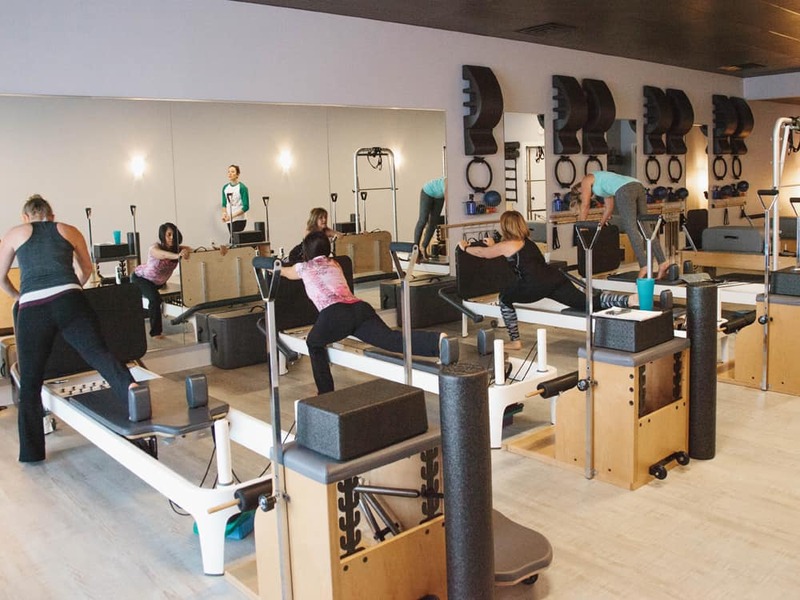 Apparatus classes are done on the Pilates machines such as reformers, trapeze tables, or chairs. These classes are smaller (no more than six (6) people) and are recommended for those who want a more tailored workout for their own individual needs with a well rounded combination of stretching and strengthening. Classes are kept small and size is determined based on the invidualized needs/goals of the group. Some of our classes incorporate other fitness modalities such as suspension and barre work. This ensures that our classes are never dull and offer something for everyone. On a Computer: Check out our dynamic schedule! You will have to create an account with a username and password and will then be able to register for classes. On a SmartPhone: Via an app store, look for the app MindBody Connect. Download the app. Search for our studio (Pure Movement, Fort Wayne, IN) and follow the directions to create an account. What are the Class Descriptions? Visit our class descriptions page to read details about classes and to register for them as well. Class levels are designed to give you the best class experience for your level of Pilates mastery. Certain props, exercises, and movements may be used in some classes, but not others. Pilates is a system of movement developed by Joseph H. Pilates in the early 1900’s consisting of a series of approximately 500 precisely designed movements performed on a mat or specially designed equipment. It is a balanced blend of strength and flexibility training that improves posture, reduces stress and creates long, lean muscles without bulking up. Pilates is functional, working several muscle groups simultaneously through smooth, continuous motion, with a particular concentration on strengthening and stabilizing the core (the abdomen, back and pelvic girdle region, sometimes referred to as the “powerhouse”). In 1926, Joe immigrated to the United States. During the voyage he met Clara, whom he later married. Joe and Clara opened a fitness studio in New York, sharing an address with the New York City Ballet. “Pilates” was becoming popular outside of New York as well. As the New York Herald Tribune noted in 1964, “in dance classes around the United States, hundreds of young students limber up daily with an exercise they know as a pilates, without knowing that the word has a capital P, and was a living person. Where the stars go, the media follows. In the late 1980s, the media began to cover Pilates extensively. The public took note, and the Pilates business boomed. “I’m fifty years ahead of my time,” Joe once claimed. He was right. No longer considered the workout of the elite, Pilates has entered the fitness mainstream. Today, over 10 million Americans practice Pilates, and the numbers continue to grow. What are the Key Principles of Pilates? There are nine key principles that are applied to each movement pattern in order to achieve the full benefit of the Pilates Method. 1. Breathing – the breath is the essential link between the mind and the body. It draws our wandering mind back into our bodies and back to the task at hand. 2. Concentration – to concentrate is to pay attention to what you are presently doing. Without concentration the exercises lose their form and their purpose. 3. Control – to be in control is to understand and maintain the proper form, alignment and effort during an entire movement. 4. Centering – in Pilates all movement radiates outward from the center. Developing a strong, stable and flexible center is one of the defining features of this form of exercise. 5. Precision – understanding proper form, placement and movement efficiency. Precision is the end product of concentration, control, centering and practice. 6. Balanced Muscle Development – understanding, developing and maintaining correct alignment and form is essential to Pilates. 7. Rhythm/Flow – rhythm and flow creates smooth, graceful and functional movements without placing stress on the joints. 8. Whole Body Movement – Pilates is fundamentally about integrating movement into a flowing whole body experience; integrating the mind with the body to create clarity and purpose; integrating mind, body and spirit to create a life of balance. 9. Relaxation – to be healthy in body and mind it is important to release unnecessary tension in order to understand the balance between effort and relaxation. How does Pilates integrate the Mind, Body, and Spirit? Mind: When Joseph wrote his ground-breaking book Return to Life through Contrology his first piece of text stated “Physical fitness is the first requisite to happiness. Our interpretation of physical fitness is the attainment and maintenance of a uniformly developed body with a sound mind fully capable of naturally, easily and satisfactorily performing our many and varied daily tasks with spontaneous zest and pleasure.” When we are feeling good mentally we ultimate look and move better too. Spirit: When the mind is engaged and focused and the body strong, flexible and coordinated the spirit is naturally elevated. The studio offers a quiet and tranquil atmosphere to support this mind, body, spirit experience with Pilates. 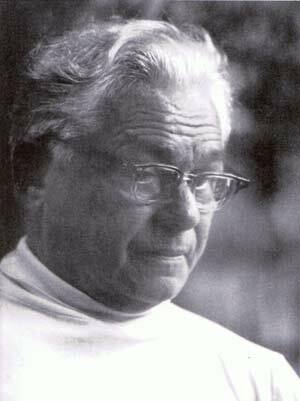 Joseph Pilates developed his method from numerous modalities, including Yoga. While Yoga is mostly performed on mats, our disicipline incorporates and utilizes large pieces of equipment or apparatuses designed to facilitate development of pure movement by creating low impact resistance. Though both Pilates and Yoga offer slower moving exercise modalities, the Pilates apparatuses tend to create longer, leaner muscles, and positive results are witness sooner in regards to muscle toning. What Type of Equipment is used in Pilates? This piece of equipment is the most widely used and versatile piece of equipment developed by Joseph Pilates. Using a simple wooden frame, a movable carriage, springs, a footbar and adjustable leather straps, Joe invented an exercise machine that address virtually every part of the body. Exercises can be performed either on your back, stomach, knees, standing or sitting, and challenge you to stabilize the trunk using your own body weight along with spring resistance to allow the extremities to move from a stable torso. 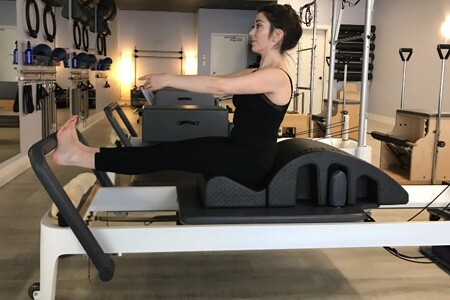 Springs of varying strengths provide resistance and support while the student pushes on the footbar, pulls on the straps, lies on the box or stands on the carriage. Starting with just the exercises that Joe invented there are more than 50 different moves that can be varied to suit the student’s needs and fitness level. Exercises vary from simple isolated movements of the arms and legs to complex exercises involving the whole body. 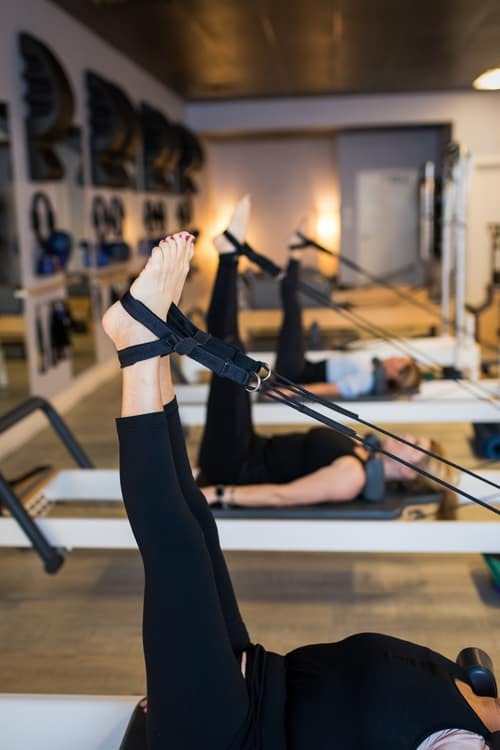 Also known as the Cadillac or the Trap Table, the Trapeze Table is based on the first piece of equipment designed by Joseph Pilates. When Joe was working as an orderly at an Army hospital in Britain during WWI, he attached springs to metal bed frames and created an exercise machine for his patients. As the concept developed, Joe added a full frame around the table and several spring attachment points to provide varying angles of resistance for a wide range of exercises. The Trapeze and Towers are versatile pieces of equipment that can be used for teaching clients at any level. They are especially useful for teaching the principles to new or injured students and for adding athletic, full bodied exercises for experienced students. Also known as the Wunda or Combo Chair, the Pilates Chair is the most challenging piece of Pilates equipment for building strength. Exercises on the Chair are great for skiers, runners, tennis players, golfers and for students looking to increase power in the upper body for throwing, lifting and racquet sports. The Chair is based on the original designed by Joseph Pilates for his students who lived in small New York apartments. It was literally an exercise machine that could be converted into a chair and put in the living room. It is a simple piece of equipment consisting of a seat and a hinged foot pedal that springs attach to. You can sit, lie or stand on the Chair or the floor and push the pedal with your hands or feet. There are over 25 different exercise categories on the Chair focusing on core strength, leg strength, shoulder girdle stability, mobility and strength as well at functional movements such as standing, climbing, pushing and lifting. This piece of equipment consists of a rounded surface called the barrel and a pair of wooden uprights tied together with cross pieces called the ladder. The distance between the barrel and the ladder can be adjusted to accommodate students of different heights. It is used primarily for stretching and to increase the strength and flexibility of the spine extension and flexion and lateral flexion. Also known as the Step Barrel, the Spine Corrector consists of a rounded surface called the barrel and a step attached to the barrel. The top of the step is called the lip and the bottom of the stem where it meets the barrel is called the well. Step Barrels usually have a handle of some kind on the side of the barrel. Step Barrels come in a variety of sizes and shapes. Joseph custom-built barrel shapes to accommodate the varying proportions of his students. It is a great addition to a Mat class adding variety and challenging new exercises. It is frequently used for students who have scoliosis or other spinal imbalances to refine the use of the spine in any position. A revolutionary apparatus, CoreAlign improves strength, balance, posture and functional movement patterns. CoreAlign has two independent discs that attach either to the front, back, or side to side, allowing the student to create more foundational gait patterns for all body type with light to heavy resistance. CoreAlign was created with the belief that the body functions and heals best when movements are anatomically sound and balanced.